Conveyors – Gravity – BNB Industries, Inc.
BNB Industries, Inc. offers many different styles of conveyors to be able to provide the best possible design for your conveying needs. We offer a variety of materials and finishes for use in all types of applications and operating environments to meet your specific need. We also custom manufacture conveyors per your specifications or drawings. Standard in 5′ and 10′ lengths with overall widths of 12″, 18″, 24″ & 30″. Straight and curved sections available. Light duty gravity roller conveyors are available in 1′ increments up to 10′ lengths and with steel or aluminum frames. Overall widths are 12″, 18″ and 24″ and are available in straight and curved sections. 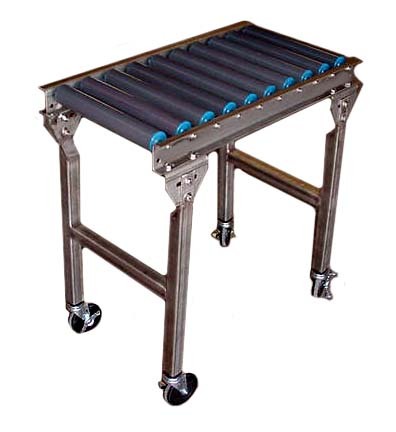 Medium duty gravity roller conveyors are available in 1′ increments up to 10′ lengths with steel frames. Between frame widths range from 13″ to 51″ and are available in straight and curved sections. 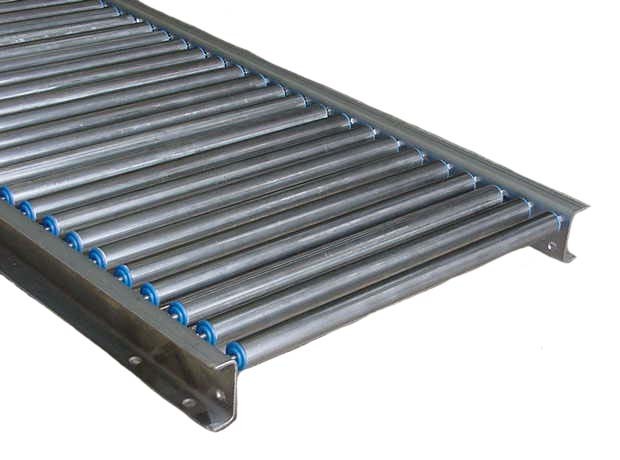 Conveyor Rails are made up of standard skatewheels mounted to various angle or channel configurations. Ideal use for trailer unloading and loading. Can be used as portable conveyor for packaging, shipping department and flexible assembly lines where needed. Skatewheel Conveyors: are the most economical and light weight conveyor for non powered application. Steel or aluminum skatewheels are mounted on axles to support and move product. The light weight construction of these conveyors makes them ideal for loading trucks with the conveyor set up on removable stands or supports. Skatewheel conveyors are good for items with a smooth, flat bottom. Majority of products will convey with a minimum amount of pitch. Skate wheel conveyors flow better than roller conveyor. 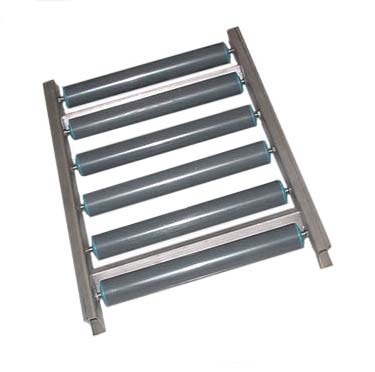 Gravity Roller Conveyor: uses rollers for greater weight carrying capacities than skatewheel. Rollers are recommended for uneven, open, or rimmed bottom totes. 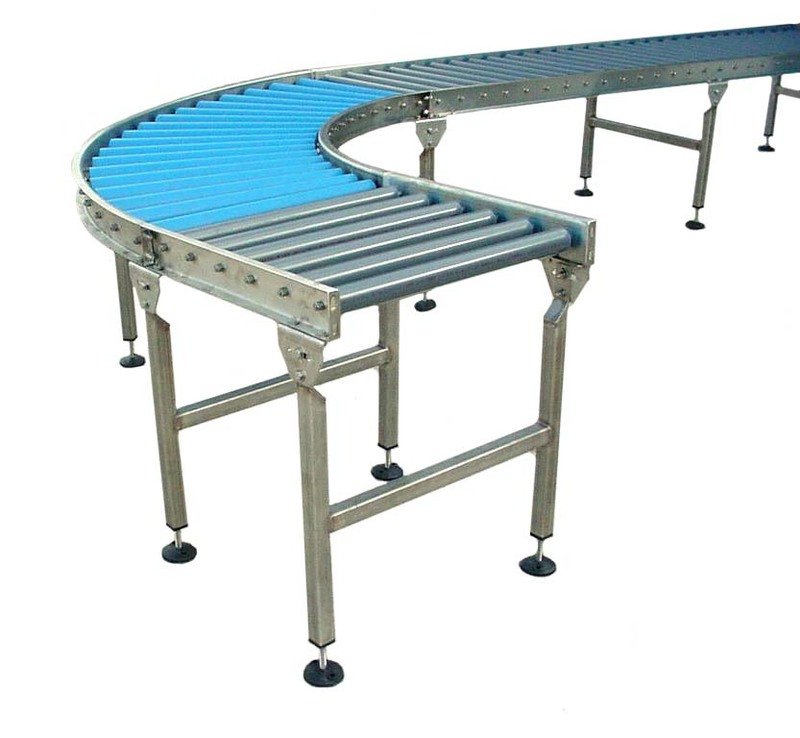 Gravity Roller conveyor is used to convey packages on permanent or temporary lines in warehousing activities, shipping department, assembly areas, etc. Majority of products will convey with a minimum amount of pitch. Ball Transfer Conveyor: used when products need to be manually rotated or correctly positioned, such as a work station or other operation that requires quick, easy handling of the product. Ball Transfer Tables are also used when two or more conveyor lines converge and packages must be transferred from one line to another. 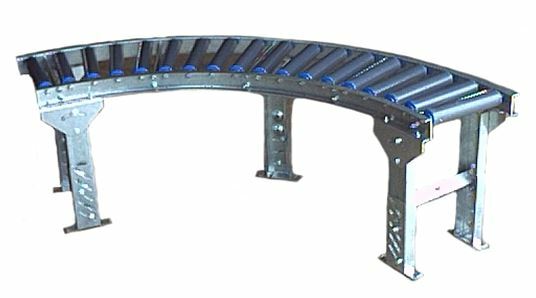 Flow-Rail Conveyor: Conveyor Rails are made up of standard skatewheels mounted to various angle-channel configurations. They are primarily used for mobile storage systems. 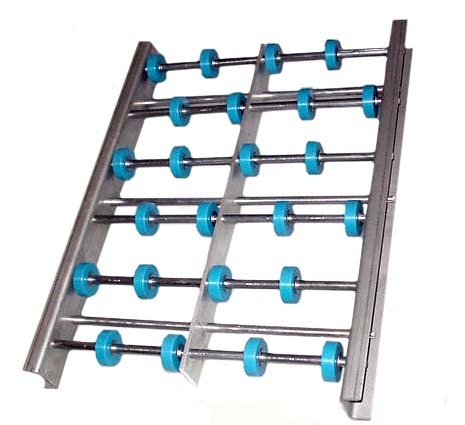 They can be mounted on floor level, elevated with support legs, mounted in storage flow racks for use as accumulation line or installed on conveyor as guiderail. Let BNB Industries, Inc. work with you to design a conveyor or conveying system best suited for your specific applications.